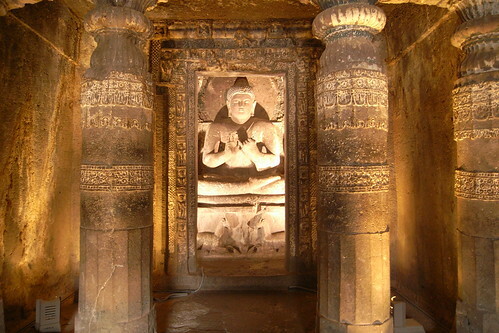 I first read of the ajanta caves in history class when I was 14 and decided I need to visit them one day. I'm finally here 13 years later. amazing. entrance costs INR 250. I had some USD from carlos just in case but turns out they only accept INR. best to wear footwear that's easy to remove as footwear is not allowed in most of the caves. the thirty rock-hewn caves at ajanta, cut into the scarp of a cliff are either chaityas (chapels) or viharas (monasteries). on the walls of the caves are paintings, many still glowing with their original colours. the outer walls are covered with brilliantly executed sculpture. the buddhist theme of the ajanta paintings recounts the life of lord buddha and tales of his previous earthly experiences.